Component upgrade to the latest stable versions. Add Apache modules : isapi dumpio logio proxy proxy_connect proxy_ftp proxy_http. Add the mm library (allows to store PHP session information in shmem). Add the Subversion Apache modules. Because of these modules, replace gdbm with Berkeley DB in apr-util. Workaround in OpenSSL on HP-UX 11.00 : SSL connection could not be established due to a problem of random number generation. Add xml/xslt support to postgresql. Add the following PHP extensions (and related libraries): ming, xmlrpc, ncurses, mcrypt. Add the GnuTLS Apache module. Add readline support to the PHP CLI interpreters. This document details how to compile a full-featured Apache/PHP distribution. The main difference with other tutorials you may find on the web is that this document not only explains how to compile Apache and PHP, but also every library they depend on. This is a 'black-box' approach, where the software comes with everything it needs to run. It is longer and more complex to build such a package but, once it is done, it brings a lot of benefits, such as an independance between your software package and the libraries that may be already installed on the target host. Such a 'self-contained' approach makes it easier to build and deploy functionaly-identical packages on several different platforms/OS. Of course, the software still uses the low-level system libraries, but the dependencies are limited to the bare minimum, minimizing the risk of inconsistent behaviors between different hosts/platforms. To complement this 'black-box' approach, we install the software in a private directory. This makes the package much simpler to manage, deploy , upgrade, or remove (compared to the traditional method of installing everything under /usr/local/[bin|lib|...]). Actually, we don't include everything needed by the package, as we only include everything we can compile. The exceptions are the Oracle client library and the JAVA JRE, which are considered as 'external dependencies' and accessed through symbolic links (so that they can be physically located anywhere on the target host). In order to apply the procedure and build the software exactly as it is described here, you don't need to be an expert : it just requires some basic Unix and shell knowledge, such as being able to download the source packages, uncompress/untar them, and create files with a text editor. and the rest is just a suite of copy/paste operations from the document to your shell environment. and even, when it is really needed, the ability to understand and adapt some C source code. So, to resume, most people will just apply the procedure described below, which is relatively easy and just requires a basic working knowledge of the Unix shell environment. Don't hesitate to post comments on issues you may have with this document. Each time you do it, you help me and the community in general to make the procedure more robust and reliable. I promise to reply to every question asked in comments. Please prefer comments to direct mail as they may benefit others. Some readers sometimes ask why I don't provide copies of the source packages I list below. Sure, it would be easier for you, but I won't do it as you MUST get your source packages from a repository you can trust ! You don't know me, you CANNOT trust source code downloaded from my site (except for my own projects). So, once again, always get your software from a trusted source and, when a package signature is provided, check it to make sure you get the official code. I insist on this because compiling some modified source code or installing some corrupted precompiled binaries would give hackers everything they need to take control on your site (remember that most software we compile here runs as root). In every chapter below, you will find a link to the best place to get the source package from. So, remain a good, slightly paranoid, system administrator, and everything will go well. These Apache modules are all compiled as shared objects (DSOs). Note that we use the GD bundled library provided in the PHP source packages (4 & 5). The package also includes the tools you need to build additional PHP extensions from the PECL library (http://pecl.php.net). Although these tools (autoconf & m4) are available in every Linux distribution, it is not the case on older/traditional/proprietary Unix. In order to remain consistent for every OS we support in this set of documents, the package includes an embedded version of m4 and autoconf. The phpize scripts are also modified to use this version. Everything written in black on grey can be copy/pasted without any modification. Everything written in red and between '<' and '>' symbols must be replaced by a value corresponding to your environment. you must replace <$BASE> with your base directory path in the line you will actually type. you copy and paste it asis into your environment. Everything related to Oracle is printed in green and can be safely ignored if you don't need Oracle connectivity. The dynamic linker (dld.sl) is severely broken on this version of HP-UX. You will need a patch to fix it. This document was validated with the PHSS_33035 linker patch installed. Thus, we consider it to be the minimum required patch level. The HP-UX patches are available from HP through the HP ITRC site. Q: How do I check if my system meets this patch level ? As these patches are cumulative, if one of the displayed numbers is equal or higher than the minimum patch level, your system is already OK. If every numbers are lower, you must install the patch (the minimum version or a more recent one). If the command does not display anything, you don't have any linker patch installed and you should also install the patch. Please note that this patch level is mandatory on the host where you will compile the package and on every target host where you will run it. C compilers can have such different behaviors that I strongly recommend using gcc. If you are using another compiler, please don't ask for support. Now, we set the 'make' commands we'll use in the rest of the document. The difference between $MK and $SMK is that, in $MK, you can add options for a 'parallel make' ('-j', '-l', ...). $SMK stands for 'serial make' and is used where parallel builds are known to fail. Mileage varies concerning parallel make. Depending on your host characteristics and the options you set, the build can be faster or slower. Personnally, after trying several options, I did not observe a noticeable gain in performance and reverted to the default 'serial' make. Please note that parallel make can cause compilation failures. So, if you get unexpected results while parallel make options are active, the first thing to do is to retry the same without the parallel options. For more info about parallel make, see the GNU make manual. GNU make is mandatory as several packages absolutely require it. On Linux, GNU make is native but, on non-Linux systems, you are strongly advised not to use the native make. it allows to set a single path in the dynamic lib search path (LDFLAGS). Putting a common 'bin' subdirectory as first element of the PATH ensures that anything we put in this directory will be found first when searching for an executable command. Last, it allows to set a single path in the PKG_CONFIG_PATH variable. Thanks to this directory structure, we don't have to modify the environment variables each time we add a library to the package. It becomes also easier to ensure that the compilation will reference our embedded library/include files, and not the ones that can be installed elsewhere in the system. First, we create the base common directory. Then, we create the script to populate the common directories. Every time we build and install a library we need to reference in a subsequent build, we call this script to register the files in the common structure. This is done through the $LINKDIR environment variable. Note that the link creation script is not in the common PATH. This way, it cannot conflict with another file. We use symbolic links for the external dependencies (Oracle & Java). This way, the package can easily run on a target host where Oracle and/or Java are installed in different locations. On the target host, we just need to create two symbolic links at the same locations and the Oracle and Java dependencies will be resolved through them. I clearly prefer this solution to the ones based on the LD_LIBRARY_PATH/SHLIB_PATH/LIBPATH environment variables. This is consistent with the 'black-box' philosophy described above, as I consider that I cannot really control the environment my software will run in. As explained above, we create a symbolic link from $BLIB/oracle_home to the Oracle install directory. We also create a second indirection level because the Oracle library hardware path is recorded with the version suffix (libclntsh.so.9.0, libclntsh.so.10.1,...). So, at runtime, the software expects the same library version it was compiled with. As we want to be able to run with any Oracle library, even if it is not the one we used at compile time, we need to create a redirection from this 'versioned' library file to the actual 'not-versioned' file. Note that the package is never guaranteed to run with an Oracle client of a version different than the one it was compiled with. For instance, if you compile with an Oracle 10 library, it won't run with an Oracle 9 version (because of a symbol added in version 10). When it is possible, the best solution is always to compile and run a software with the same library versions. The external Java SDK will be accessed through a symbolic link. At runtime, we just need a Java Runtime Environment, not the whole JDK. Some files we generate have a runtime dependency on the libgcc_s shared library. It means that this library must be present on the target host. In accordance with our 'black box' approach, we embed a libgcc_s library in the package and we force everyone to reference this copy. If you don't have a libgcc_s shared library on your system, the best solution is to rebuild gcc (gmake bootstrap builds the shared gcc lib we need). The zlib library provides the gzip (GNU zip) compression/decompression features. 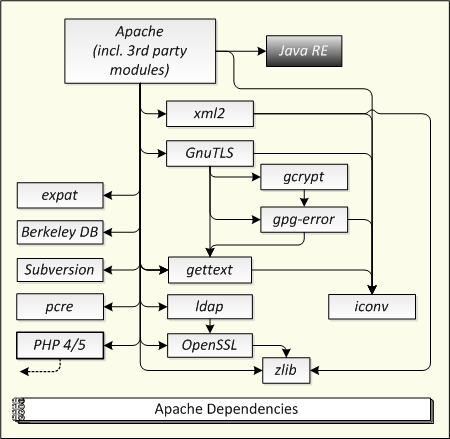 The OpenSSL library provides the mechanisms to establish SSL-secured connections. It is used by Apache to handle HTTPS connections, by PHP to provide SSL features, and also by OpenLDAP, curl, MySql and PostgreSql. As the configuration process ignores the LDFLAGS environment variable, we modify several variables related to the way the libraries will be linked. "EX_LIBS = $LDFLAGS -ldld -lz"
[ -z "$NO_TEST" ] && $MK test "EX_LIBS = $LDFLAGS -ldld -lz"
We only compile the LDAP client, excluding the server and the replication daemon. Then, we keep the library and include files only. The TCL stuff is useless here. So, we don't compile it. The HP-UX system does not provide a reliable random number generator as expected by Apache. An optional software (KRNG11i) is available, but only for HP-UX 11.11. So, we modify the code to use the stdlib random() function. It is probably less secure than KRNG11i but it does not add an external dependency in the runtime environment. If you are running HP-UX 11.11 and want a better random number generation, download the KRNG11i package and ignore the modifications we do below on apr.h and rand.c. But the drawback is that you will need to install the KRNG11i software in your runtime environment before activating the modules using this feature (mod_auth_digest and mod_auth_cas). As our LDAP library is not in the standard location, we need to build and install the apr and apr-util libraries first, splitting the compile process in 3 steps. We also modifiy the apr-config script because we want apxs to link with the hardcoded library search path. Fix : if the host contains an older version of the zlib headers in /usr/include, it may contain a file named zutil.h. In this case, the Apache configure phase wrongly states that it can include this file. But, this header file is incompatible with the version of zlib embedded in the package, and the compilation fails. In order to force this header file not to be used, we un-define the corresponding symbol in the auto-generated Apache header file. Please refer to the 'compiling PHP' chapters below for an explanation of the LDFLAGS setting. The configure stage does not detect OpenSSL, as it does not detect the '.sl' suffix for shared libraries. Bug reported to the Apache Dev as #40917. Workaround : we temporarily create a fake 'libssl.so' file in the OpenSSL lib directory. As the current makefile ignores our LDFLAGS settings, we link the shared library with our own command. We also must install the files ourselves as the Makefile is unable to do it. managelogs is a log processing program to be used in conjunction with Apache's piped logfile feature. It automatically rotates and purges log files based on a set of user-defined options. This is a software I wrote as an alternative to rotatelogs, as rotatelogs is not able to purge the log files and, typically, must be complemented with cron jobs to avoid filling up the file system. The configure script prepends a '-Wl,' prefix to every elements of '$LDFLAGS' that don't already start with this string. This is correct except for the '-L' option, as it prevents the libgcc_s library to be located in $BLIB/common/lib. To fix this problem, after the configure phase, we reset the '-L' option where it has been modified. In this configuration, mod_evasive is inactive. To activate it, uncomment the corresponding LoadModule line in httpd.conf. mod_auth_cas allows to authenticate against a CAS (Central Authentication Service) server. This module is not the only way for an application to authenticate users against a CAS server, but it is probably one of the easiest to use, as it transparently redirects the requests, silently validates tickets, and automatically provides an authenticated '$REMOTE_USER' to the application. From the source directory given above, download the mod_auth_cas.c and mod_auth_cas.h files. In this configuration, mod_auth_cas is inactive. To activate it, uncomment the corresponding LoadModule line in httpd.conf. The freetype compile process wrongly states that gcc needs a '-ansi' option to compile in ansi mode. This option is not needed, and it even causes the compilation to fail in several environments (at least HP-UX 11.00 and AIX). So, we remove this option from the compile string. Our CURL client will support the following protocols and options : http, https, tftp, ftp, ftps, telnet, dict, ldap, ldaps, file, and gzip compression. It is also able to connect through a proxy. When curl needs to validate a certificate, it will use the content of the $BLIB/curl/share/ca-bundle.crt file. By default, the file does not exist, and the certificate chain is considered as empty. This file can be created and filled with the CA certificates you want curl to consider as trusted (in PEM format). You need to register (free) to access the download area of the Breach security labs site. Once you get there, the source package you need is named modsecurity-apache_x.x.x.tar.gz. You don't need to dowload the 'modsecurity-core-rules' file, as the rules are already included in the source package. In this configuration, modsecurity is inactive. To activate it, uncomment the 'LoadModule security2...' line. We force the Makefiles to link through gcc, instead of calling ld directly, because we want our LDFLAGS to be used and it may contain options which are not supported by ld (as the options starting with -Wl). The '-with-included-gettext' configure option forces to build and use the included libintl library, even if one is present in the system libraries. This removes a dependency to the system libraries and ensures that we use the same libintl code across all platforms. Note that, even if we try to disable NLS localization everywhere it is possible, some software don't allow it to be disabled. That's why we still need to embed a libintl library. The Apache modules we build here allow to use Apache as a gateway to access a Subversion repository. You will find more information about configuring Apache as a Subversion gateway in this document. Subversion requires the apr-util Apache library to be compiled with the Berkeley DB. We need to tell configure how to find the required libraries at link time (by initializing the LIBS variable). If we don't, the configure phase fails when the libintl (gettext) library is not installed in /usr/lib. This is probably a bug in the configure script. Because of this problem, we also need to add '-lintl' to the list of libraries we link with. The default Makefile renames the object files with a '.so' suffix instead of the usual '.o'. Some OS (like AIX) cannot link files ending with '.so'. So, we modify the Makefile in shlib to keep the '.o' suffix. We also need to force the commands used to link the shared libraries, as the Makefile uses ld by default, and we can have some gcc-specific options in CPPFLAGS/LDFLAGS. So, we force it to link using 'gcc -shared'. On HP-UX 11.11, we need to redefine a field name in the sockaddr_storage structure. This is done through the CPPFLAGS environment variable. We don't compile the C++ library as we don't need it and it creates an unnecessary dependency on the libstdc++ library. Note that mod_gnutls and mod_ssl can both be loaded on an Apache server together but cannot be activated in the same virtual host. On HP-UX, the shared library file suffix is '.sl', instead of the usual '.so' found on other systems. Here, libtool is used to compile the module, producing a '.sl' file, and apxs is used to install it, expecting a '.so' file ! So, in order for the install phase to work, we rename the file once it is built. The IMAP distribution does not provide a way to build a shared client library. So, we do it our way : we build the static library first, with the '-fPIC' compile flag to generate relocatable objects, and, then, we build the shared library from these objects. We have to provide the MD5ENABLE definition because it is not provided by the system includes. We need a libc-client.a file in $BLIB/imap/lib because the PHP configure process specifically tests for the presence of this file. But we don't really need the static library as we'll only use the dynamic one. So, we create $BLIB/imap/lib/libc-client.a as a symbolic link to the dynamic library. The configure process does not use CPPFLAGS and LDFLAGS correctly (the problem only appears when the libraries are not installed in the usual locations). As a workaround, we feed it with modified values for some other environment variables. mm's Makefile does not use the LDFLAGS variable, but we need this flag to be set in the link command, to specify an hardware library search path. Bug reported as Feature request #122, supposed to be fixed in version 1.4.2 but the fix doesn't work as it assumes that libtool automatically includes the content of the $LDFLAGS variable, which is not the case. So, we still need to patch the Makefile.in file manually before compiling. GNU awk is needed on HP-UX because, on this system, the default awk command does not support more than 3,000 bytes per line. It may seem much but, during its compile phase, bison needs more ! So, we need to replace awk with gawk which has no limitation on the line length. This is really needed on HP-UX only but, in order to remain consistent on the different OS we are building on, we use gawk on every OS. Download the Libmcrypt package, not Mcrypt, as we just need the library. We also need to define two replacement malloc()/realloc() functions. If we don't define them, the resulting libraries cannot be loaded on environments (like AIX) which don't provide 'GNU compatible' allocation functions. Actually, the configure tests for these functions to be 'GNU compatible'. When they are determined not to be compatible, every call to malloc()/realloc() is replaced by a call to rpl_malloc()/rpl_realloc() and the package is supposed to define these two functions. Unfortunately, mcrypt does not provide these functions. So, on systems lacking 'GNU compatible' allocation routines, when you try to load the mcrypt shared library, the load fails with an 'unresolved symbol' error. To work around this issue, we define both 'GNU compatible' functions at the end of one of the mcrypt source files, so that they are compiled and included in the library. Then, we build the usual way. We disable dynamic loading of mcrypt modules because, every time I tried to enable it, the configure command failed. PHP 4 finds Oracle libraries in $ORACLE_HOME/lib. But we are on a 32 bit environment and the corresponding libraries are in $ORACLE_HOME/lib32. This bug has been corrected a long time ago on PHP 5 but it seems to be still present in version 4. Workaround : we modify the Makefile after the configure stage. During installation, PHP inserts a 'LoadModule' line in httpd.conf. As we cannot have both PHP modules loaded at the same time, we decide that the default PHP module will be PHP 5. So, we comment out the PHP 4 LoadModule directive in the httpd.conf configuration file. We modify the 'phpize' script so that it uses the embedded autoconf and m4. We also force the shell to be a korn-compatible shell (on some OS, /bin/sh is a Bourne-only shell, which does not work with phpize). See the next chapter for an explanation about LDFLAGS and libcrypt. As with PHP 4, we modify the 'phpize' script so that it uses the embedded autoconf and m4. We also force the shell to be a korn-compatible shell (on some OS, /bin/sh is a Bourne-only shell, which does not work with phpize). If your compilation fails with a message starting with 'cc1: out of memory...', increase the value of your maxdsiz kernel configurable parameter (this operation requires root privilege and reboots the host). Typically, using gcc 4.1.1, a value of 100,000,000 (100 Mbytes) should be large enough, even when using the gcc '-O3' flag. Issue with libcl (Can't dlopen() a library containing Thread Local Storage). Because of this problem, we cannot dlopen() the Oracle extensions (oci8 and pdo_oci) because they indirectly reference libcl, which uses some thread local storage. Reference of the document describing this problem in the HP ITRC website : AUSRCKBAN00000314. PHP bug #13151. It probably won't be fixed soon, as it is not really a problem of PHP. Workaround : The executable file which does the dlopen() call must have been linked with the library using TLS (libcl here). Here, it means that we must link the apache and php executable files with a -lcl option. That's why we set LDFLAGS='-lcl'. Ignore this error message from configure : './configure: pkg-config: not found.'. It is a configure bug reported to the PHP Dev team as #35981. This error does not seem to have any influence on the rest of the build process. HP-UX contains an empty library /usr/lib/libcrypt.a. But the crypt() function is in libc. Because of the libcrypt.a file, configure decides to include '-lcrypt' in the linker flags. And, later, as there is no libcrypt.sl file, PHP refuses to build some modules in shared mode. Workaround : we temporarily rename the /usr/lib/libcrypt.a file. PHP 5 does not support Oracle below version 9. So, if the Oracle library we have in $ORACLE_HOME is version 8, we cannot compile the Oracle-related extensions. Note that, on HP-UX 11.00, Oracle does not provide a version greater than 8i. we detect if the Oracle client library is an instantclient and set the the configure options accordingly. As $BLIB/common/bin is first in path, configure always uses our embedded version of m4. Ming is a library for generating Adobe/Macromedia Flash files (.swf). It allows PHP to generate Flash animations and interactions dynamically. The ming extensions contained in the PHP 4 and 5 source distributions don't work with libming version 0.4.x. So, we build the PHP extensions provided in the ming distribution. We compile the extension for PHP 4 and 5. APC stands for 'Alternative PHP Cache'. It is a free, open, and robust framework for caching and optimizing PHP intermediate code. Depending on the application, it can provide really dramatic improvements in terms of response time and CPU/memory usage. Copy the apc.php file from the 'lib/php' subdirectory to a directory accessible by a web browser. Edit apc.php and modify the line starting with 'defaults('ADMIN_PASSWORD',' to set a password of your choice (mandatory to access protected features). Open apc.php through your browser. We also pre-configure the php.ini file with a basic set of APC parameters. If you are interested in PHP performance improvement, you may also have a look at a number of other software like XCache, eAccelerator, memcache, PHK, Automap... All these PHP extensions can be compiled and installed in a similar way as what we show here. On HP-UX, the system does not define the MAP_ANON symbol. This symbol is used by apc_mmap and corresponds to a value of 0 in the mmap() flag. So we force the symbol definition. Note that we keep autoconf and m4, to be able to compile and install additional PECL extensions. Here, we give only a minimal configuration, which allows to start Apache and to run a simple test. When the package is installed on a target machine, it must be configured in a much more serious way. This aspect is beyond the scope of this document but you can find a lot of resources on the Internet. Warning : Running this package with the default configuration in a production environment can lead to serious security problems !! Check that a www user exists in /etc/passwd. If not, create it with passwd='*' and login shell = /bin/false. Add a www group in /etc/group if it does not already exist. Change the line containing 'Group #-1' to 'Group www'. In order to avoid a problem of Apache crashing on HP-UX (message 'cannot grab mutex'), HP recommends to add this line to the configuration. The only thing I can say is that it solved the problem for me. This should not display any message. Here, we just check that the PHP shared modules can be loaded without error. It can be useful to run this test when you install your package to a new host, as it allows to check that every shared lib dependencies are satisfied. The syntax we use here must be compatible with PHP versions 4 & 5. That's why we cannot use scandir(). By default, you will be testing PHP 5, as it is the one we chose to activate in the Apache configuration. In order to test PHP 4, comment out the PHP5 line in $BAP/conf/httpd.conf, uncomment the PHP4 line, restart Apache, and reload the page from your browser. It should display the configuration of every PHP modules, static and dynamic. If there are some errors when trying to load a module, it will also display them. RPM is not provided by default on HP-UX but you can build and install it. Note that we build a binary RPM, not a source RPM. <Insert preinstall shell code here. This code should check for a 'www' user and group, and create them if they don't exist. The first lines contain information about the packages's name, requirements, packager (you), and a description. the pre-install script ensures that the www user & group exist. If it is not the case, they are created. The pre-uninstall script stops Apache and remove the log files. Then, we give the list of the files, with some of them being tagged as configuration files (see the rpm documentation for more information on the %config tag). This will create a file named http170-1.7-0.hppa.rpm in the 'RPMS/hppa' subdirectory of your RPM install base directory (/usr/src/redhat on RHEL). This is your RPM package file. This package can be installed, as any other RPM packages, using the rpm command (man rpm for more). A tar package just contains every files under $BASE. This creates a '.tgz' package file in /tmp. Untar/uncompress the package file in $BASE. Once the package is installed, you can create the symbolic links to the Oracle and Java installation directories as $BLIB/oracle_home and $BLIB/java_home. You can also run the test above to check that the PHP modules can be loaded correctly. Thanks for this really great work! I have spent endless hours in useless attempts to compile PHP on HP-UX 11.11 before I found this documentation. Using the precompiled version of HP was not an option for me, because I need additional modules like SQL-Server support. 1. You don't say anything about using the 32 or 64 bit version of HP-UX. I was not able to compile it on a 64 bit environment. Do you have any suggestions on this? However, most important is it works now. This is not part of the HP ANSI C compiler, it is only on the same CD but available for free. Yes, I only tried it on 32-bit environments. I will try to find some time to build on 64-bit. No, it should work with '-lcl' specified at link time. In order to see if the flag was really used, try to 'ldd' apache/bin/httpd and php/bin/php. You should see libcl in the result. And, if you see it, you shouldn't meet the 'dlopen' problem. Please tell me what this test gives. I avoided the LD_PRELOAD solution because it is a good solution for PHP through Apache, but not a very clean one for PHP in CLI mode. I have just downloaded everything mentioned. We have been trying to figure out how to get all this to run independantly to shared libraries on each server. We support over 50+ internal servers. For years, we have been living with apache 1.x, NO PHP, or anything else. All due to the fact that we push our internal application to a HP-UX system and flip the switch. We have all of our self written code and packages like apache within a single directory structure off of the root directory. Everything that we count on resides 99% internally to that directory structure. If everything that you have accomplished here works for us, you'll be putting us back into the mainstream of features that we desparately need. Now I am going to be trying to get this compiled and put together on an HP-UX 11.23 PA-RISC system. One of the pre-requisites calls for X11MotifDevKit. This seems to be part of the purchased HP ANSI C compiler. How important is this to completing the process? We want what is commonly referred to as gd2. I am assuming that this is what you are in "Annexes - Optional" Section of the documentation. Am I correct? And in looking at the options for compiling MySQL, is this going to generate a fully functional installation of MySQL? We are definitely looking to include MySQL into our package. If this doesn't give us a complete installation, do you have any recommendations on what to change in the configure to provide us with a working version? Any advice would be greatly appreciated. I'm not for compiling these things on my own. I am at the mercy of the community that knows how all this works. One of the pre-requisites calls for X11MotifDevKit. This seems to be part of the purchased HP ANSI C compiler. How important is this to completing the process? The Motif dev kit is used only when compiling libXpm. If you don't build libXpm, you remove Xpm format support from the GD library (which is not critical for most users). No, PHP includes a bundled version of the GD library (GD2). Most people will take this version and this is what I use in my procedure. The 'annexes' part must be used only if you want to use another (unbundled) version of the GD library, which is certainly not your case. The procedure I give in the article builds a fully functional MySQL client for PHP. But it contains an 'rm' line which suppresses everything which is useless from a PHP point of view. If you want to keep all the tools, examples, static libs,... in your MySQL client, don't 'rm' anything. And if you want to build more than the client, change the configure line. See below the output of ldd apache/bin/httpd. What about imap vs php ? The new version of this document (published on 26-JUL-2006) includes the IMAP extension. Since this guide suggests you have succesfully compiled 5.1.6 against Oracle 9.2 client, I will next try compiling 5.2.0 against that older version of Oracle. Works like a charm on HP-UX 11.11! I had to downgrade to php 5.0.5 in the need of those native informix functions, but apart from that, everything works fine.